Tadek Gawor is the Team Manager for the SFFNZ Team to 38th FIPS-Mouche World Fly Fishing Championship in Italy in September 2018. Tadek is an ameteur fly fisherman and was introduced to fly-fishing in 2006 and ever since he has experienced fly fishing around Wellington, Wirarapa, Rangatikai, Ruapehu and Taupo regions of New Zealand. 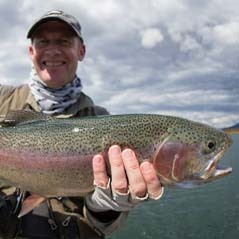 Tadek enjoys trout fishing on New Zealand lakes and rivers. Recently Tadek moved to live and fish in Matarangi, a picturesque seaside resort in the Coromandel Peninsular. The new location proved to be a great base for sea fishing and experimenting with fly fishing for kahawai…a strong fighting fish, offering a hugely rewarding experience to an angler. Tadek joined SFFNZ in 2013, an organisation with an aim to promote sports fly fishing in New Zealand. Tadek has competed and/or assisted as a controller in several SFFNZ regional and national championships. He was the Team Manager for the SFFNZ Team to the 34th FIPS-Mouche World Fly Fishing championship in 2014 Czech Republic. Originally, Tadek comes from Kraków (Poland). He is married to Maria and has two adult children, Piotr and Dominika. He has now lived and worked in New Zealand for 37 years (Wellington, Auckland, Palmerston North and now Matarangi). He has lived and worked in the USA and Australia. Tadek is now retired. His professional background includes 20 plus years of Senior Management and Business Consulting experience. He continues to be a shareholder and a director of a recruitment business he co-founded in 2003. 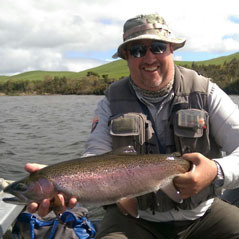 Brendan was first introduced to fly fishing at the age of 13 on the Waiteti Stream at Lake Rotorua on a family holiday. The local fishing lodge owner (a passionate fly fisherman himself) took the time to show a young Brendan the sport. Following the many hours on that spawning stream Brendan was hooked and his fishing career began! After several years playing Cricket to a national and international level (outdoor, representing Auckland in New Zealand's first class competition and indoor ultimately representing New Zealand) Brendan was searching for a different sporting experience. He made the connection: fly fishing and NZ (the best country in the world for this). Brendan returned to fly fishing in his late twenties with his younger brother Nick, both of whom really immersed themselves in the sport. Driven by the inevitable sibling rivalry they both fell into the competition scene as a natural development to progress and become better anglers. Even more importantly in order to improve their skills to ensure that they better each other on the rivers and lakes around New Zealand's North Island. Brendan, and Nick, competed in regional, national, Oceania and Commonwealth competitions in the years that followed. Brendan's most notable performances was 2nd in the 2013/2014 Nationals, 4th in the 2015/2016 Nationals, 3rd in the 2016/2017 Nationals and being part of winning Oceania team's at home in New Zealand in 2009 and 2017. Brendan's most memorable achievement was winning the 2009/2010 National Pairs competition with his brother Nick as his boat partner. Brendan's favourite fishing locations are the lakes in the Turangi / National Park area (Rotoaira, Otamangakau and Kuratau), he also enjoys fishing the many rivers in the Hawkes Bay with Nick who has recently relocated there with his family. Mark’s first exposure to Competition flyfishing was a NZ team clinic fund raiser demonstrating river fishing techniques. These open Marks eyes to a very different approach to fly fishing to those that he had used. This experience and meeting the NZ team eventually stimulated him to have a go at competing. Mark says “Until then I rarely fly fished in the summer –instead chasing game fish from small boats on both coasts around the top of the North Island…For many years all I did trout fishing wise was go for big NZ trophy fish… I never thought in a million years I’d get a buzz out of regularly drive 4 hours in a day to go practice competition angling across a raft of water types and fisheries”. Mark got the bug bad and has been a long time regular on the competition circuit in NZ. He enjoys the constant exposure to new ideas and new challenges that competition fishing gives, but also the pleasure of fishing on some of our fantastic rivers and lakes. During his long tenure in the sport Mark has clocked up some notable accomplishments namely, Oceania individual champion (2013), and Oceania team gold (2017), NZ National Lake Champion and third individual (2016). He also holds an (unofficial) record for the biggest trout (70cm rainbow) fish caught in a FIPS sanctioned comp in New Zealand. Mark was the owner of a Veterinary practise in Auckland, but since selling his business he is now an employee there, having more time to do more fishing. He is supported by 3 daughters Melinda, Tayla and Britney and his wife Debbie. Although he notes his fascination with the sport remains a complete mystery to them! Paul grew up in South Canterbury with a small trout stream at the back door. Fishing has been a big part of his life - on streams with light spinning gear, salmon fishing on the Rangitata River, and family holidays at Lake Ohau, trout fishing was always part of family activties. His father, uncles and grandfather were all fly fishermen. Paul has been a regular in New Zealand teams since fishing in the Commonwealth Championships on the Tukituki River in Hawkes Bay, New Zealand in 2008. Since then he fished the Oceania competitions in 2009, 2011, 2013, and 2015, the Commonwealth Championships in 2010, 2012 and 2016 and the World Championships in the Czech Republic in 2014. He placed third individual at the Oceania competition in Ballarat in 2015, and placed third at the New Zealand Championships in 2017. The World Championships in Italy will be Paul’s tenth international event. Paul is an honorary life member of the Wellington Fly Fishers Club. He was also on the Executive Committee of the New Zealand Federation of Freshwater Anglers from 1991 through to 1996. He has organised the SFFNZ Wellington Regional Fly Fishing competition since 2004. 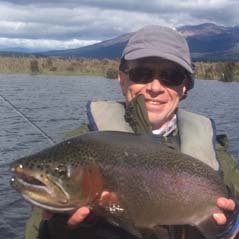 His wife, Judy, is a competent flyfisher, and his two daughters Megan and Rachel have the occasional fish when on holiday at the family’s second home in Turangi. In addition to his fishing, Paul supports his daughter Rachel at many of the multi-sport events that she participates in. Consistent results over the past 18 months have seen him gain slection in this years NZ Team, heading to Slovakia. He is super excited at the prospect of fishing in such a beautiful country and being a member and angler for the NZ Team.